Dr Oz shared that although a lot of people are following and loving his Total 10 Rapid Weight-Loss Plan, he’s been getting some feedback on the breakfast smoothies, saying that some people simply prefer to chew in the morning. 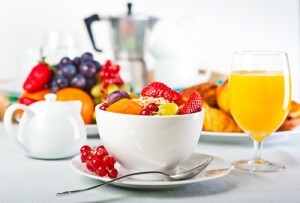 He wanted to share easy Total 10 breakfast recipes that you can make that will help you lose weight. The first idea Dr Oz shared was to make scrambled eggs out of one whole egg and two egg whites. Dr Oz said that plain scrambled eggs can be a bit boring, so you can add some of the unlimited non-starchy vegetables from the plan to the eggs to spice things up. You can make huevos rancheros, which is the scrambled eggs topped with red peppers and two tablespoons of salsa. Or you can make caprese style eggs by topping your scrambled eggs with red pepper, garlic, tomato, and basil. Next, Dr Oz explained that the Total 10 plan calls for protein at every meal, but meat isn’t just for dinner. He said if you’re missing your bacon or sausage in the morning, you can actually make your own breakfast sausage. You can make it ahead of time and store it in the fridge. You can enjoy the sausage over spinach, with a poached egg and asparagus, or over peppers and onions with a scrambled egg. Dr Oz explained that if you’re eating meat for breakfast, that takes away from some of the meat you would normally have later in the day, but you can also move the breakfast smoothie to another time of day as well. He said the great thing about the plan is the ability to mix things up so you can make it through the two weeks with ease. Combine ground turkey with seasonings. Cook in a skillet coated in cooking spray on stovetop over medium heat until brown. Enjoy 1/4 C serving throughout the week. Next, for everyone who loves cereal, Dr Oz said you can make quinoa for breakfast. Dr Oz said quinoa is the perfect mixture of protein and fiber. If you’re someone who likes hot cereal like porridge or oatmeal, you can make the Total 10 hot quinoa porridge, or if you like cold cereal you can try the quinoa crunch cereal, but remember you can only have half a cup of quinoa per day. Microwave for 30 seconds or until hot. Dr Oz also shared how you can make a muffin out of your quinoa. I would definitely throw in some peppers and spinach to these muffins! Coat muffin tins with cooking spray. Combine ingredients and pour mixture into tins. Store leftover muffins covered in refrigerator. Heat two muffins in microwave for 30 seconds for breakfast during the week and enjoy! I graduated from the University of Cincinnati with a degree in Journalism. I played volleyball for the Bearcats and have been an avid sports fan my entire life. If I'm not glued to my computer screen, I'm chasing after my enthusiastic little boy. I have a passion for writing, reading, and all things health and fitness. Oh, and of course TV! I can not find the eating diet for the thyroid problem you were talking about on 1/14/05. I have the problem and don’t want to start taking medicine. ENJOY YOUR SHOW EVERYDAY!! !